There are several Obama facts websites floating around the internet, but few of them address the sincere questions that people may have about the current President. Barack Obama was born in Hawaii, to a black man from Kenya and a white woman from Kansas. Barack Obama was elected to be a state senator in Illinois in 1996, where he served for nearly eight years. Barack Obama won election to the United States Senate in 2004, after defeating a large field of candidates in the primaries. He had given high-profile speeches opposing the Iraq war just over a year earlier, which may have earned him a considerable number of voters. He then became the nominee of the democratic party in the 2008 presidential election, and is now President of the United States. At age six, Obama had moved to Indonesia, where he lived for a few years. Obama worked as a community organizer immediately after graduation from college. He also worked as a university professor, political activist, and lawyer before serving in the Illinois Senate from 1997 to 2004. He was propelled to stardom by giving the 2004 democratic convention keynote speech. Obama has sponsored bills ranging from lobbying and electoral fraud, climate change, weapons control, nuclear terrorism, and better veterans care. Most internet advertisements about Obama lead to false, misleading websites created by republicans. Obama's father was not a radical muslim either. His father was more or less agnostic, similar to his atheist mother. 1. Obama is not bitter, but he understand that you just might be a tiny bit bitter if you lose your job to China. 2. Barack Obama invented Open Source software with the help of the guys who started ARPAnet. 3. Barack really believes that over a million people would give money to a smart black guy running for president. Like that would ever happen. 4. Masamune, the legendary Japanese swordsmith, created a sword called the "Obama". He would slice things, and it would change them into something better. He often sliced bread and it would change into roast beef. 5. Barack Obama has written two books, one about honesty, and one about hope. 6. It seems that Barack Obama does not utilize the art of old-skool politics, and does not use slash and burn tactics. 7. The creator of Final Fantasy VII originally wanted to name Sephiroth "Barack Obama", but they realized Sephiroth was too evil for it to work. 8. Sometimes when playing Halo 3, Barack Obama switches places with your character - this usually happens when you nearly die in a battle, but somehow come out on top. 9. Obama once attempted to download the paid version of Napster, but somehow Ares was developed instead. 10. The University of Chicago once did an experiment. They put Barack Obama next to a solar panel and told a funny joke. As Obama laughed, his teeth reflected the sun onto the panel, which generated enough electricity to power the university for a week. 11. 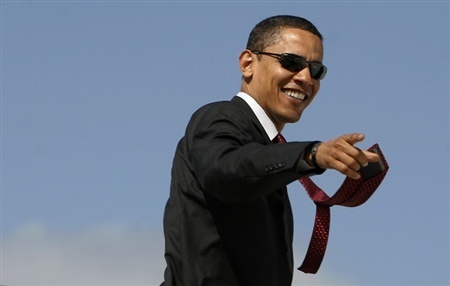 Obama once stubbed his toe and said "Sunny Beach". Publisher's Clearing House arrived moments later with a free trip to Florida. 12. When people sneeze in heaven, God typically says "Obama bless you." 13. Some people think it is not a coincidence that Barack Obama rhymes with Dalia Lama. 14. The first time Obama said "Yes We Can", sales of canned foods doubled the next morning: Campbells was very happy. 15. Obama will be on the 1000 Dollar Bill next time it's produced.